The dress originally belonged to Miss Ethel Gordon. Miss Gordon was born in Ireland in 1875 and immigrated to Regina Saskatchewan (date unknown). In the 1930s, she settled in Vancouver, where she lived for the rest of her life. Among her belongings was this dressed, tucked away with other early mementoes. The dress dates to the early 1880s, as is evident by the slim S-shaped silhouette and exaggerated bustle. It would have be worn as a formal reception dress (perhaps to welcome guests to a formal dinner or late-afternoon tea.) The gown is made of black silk and adorned with fine lace with gold silk trim. The lace is delicately hand-embroidered with tiny glass beads. This style of trim is commonly found on gowns of this era, but the beaded detail adds a touch of luxury, as hand-beading was not for common everyday garments. A modest but also sensuous example of late Victorian dress. But alas, the silk shift and gold trim are frayed. The beadwork is loose in places and needs re-embellishment. With the generous donation of our SMOC Sartorial Surrogates, and some TLC from professional costume restorers, this dress will once again glisten and shimmer back to life. Decorated with turkey feathers. Lined with quilted white satin. Damask fabric weave shows meandering signs of foliage and squirrels. Cape has Medici collar and fastens at front with hooks and eyes. 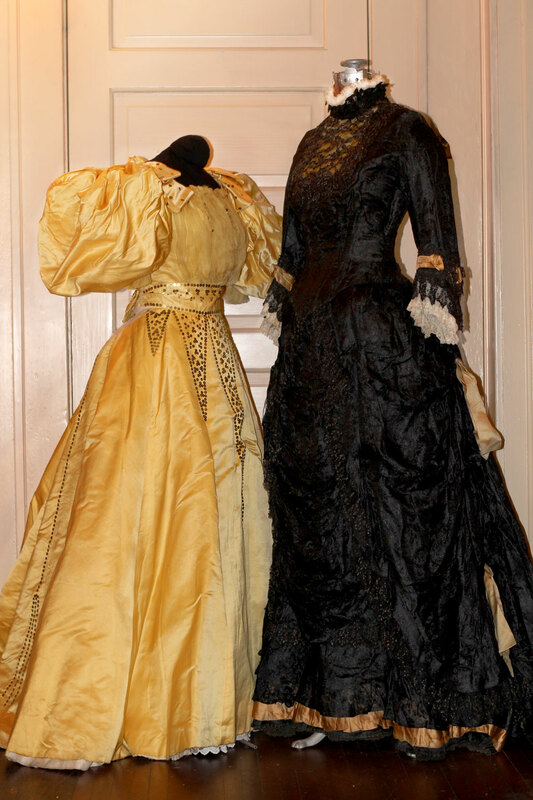 For more information please contact info@smoc.ca, or make a donation toward the restoration of this our beautiful garments via the Donation button below. ….and immortality: each time the garment is viewed in future, you get a mention of gratitude! All donations for Adopt-an-Outfit qualify for a Tax Receipt.